There is an old saying, "When it rains, it pours." This saying could very well be applied to blogger events. Few weeks ago, I literally attended four events; one day after another. The god of vanity were being overtly generous towards me, cause all the events were being hosted by beauty and personal grooming brands. This post features two of those events. Not only did I have a great time at both these events, but I also got a chance to learn some amazing makeup tips and hairstyles. 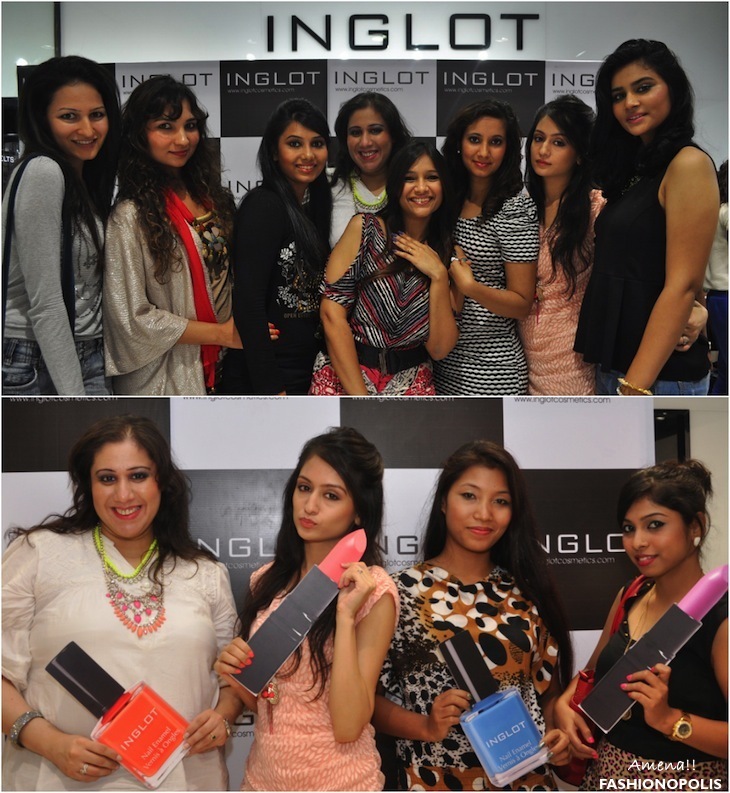 Inglot recently invited a few fashion and beauty bloggers to experience 'the world of Inglot' with our bestie at their Khar (Bombay) store. 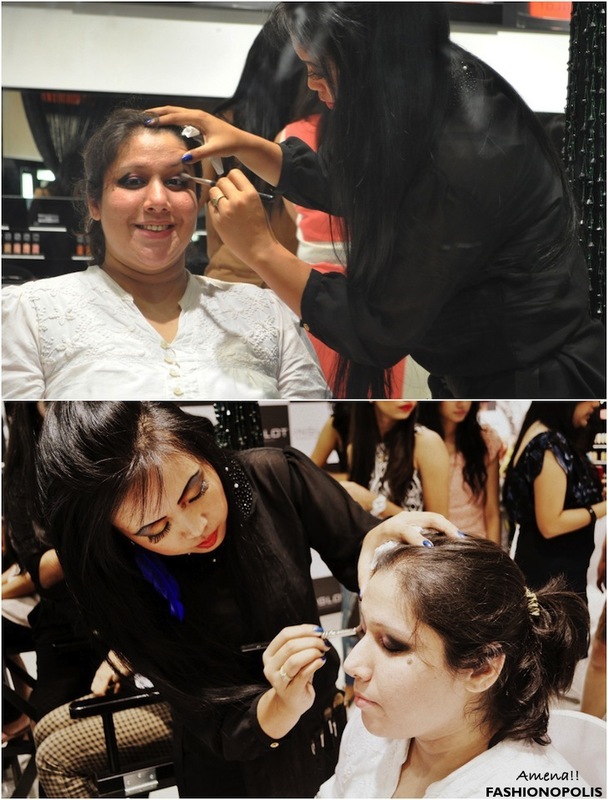 Along with getting our makeup and nails done, one of the key highlight of the event was learning new makeup tricks and tips from makeup maverick, Ojas Rajnani. Always use a lip pencil/ lip liner matching the shade of your lipstick or matching your natural lip colours; not a shade darker than that. If you have deep set eye (like me), do not apply kajal/ eye liner all the way to the inside tip of the eye, instead start from where your lashes begin. It is advisable to apply lipstick with a lip brush, rather that directly from the tube. Other than being hygienic, this also gives a better finish. I don't know about you, but I totally love getting my makeup on. My bestie for the event, Aamna, flaunting her gorgeous caviar manicure done by the team of Nail Spa. Inglot has one of the finest range of nail polish shades. Amazing colour selection. No blogger event is complete without a group photo. Bloggers and their besties. 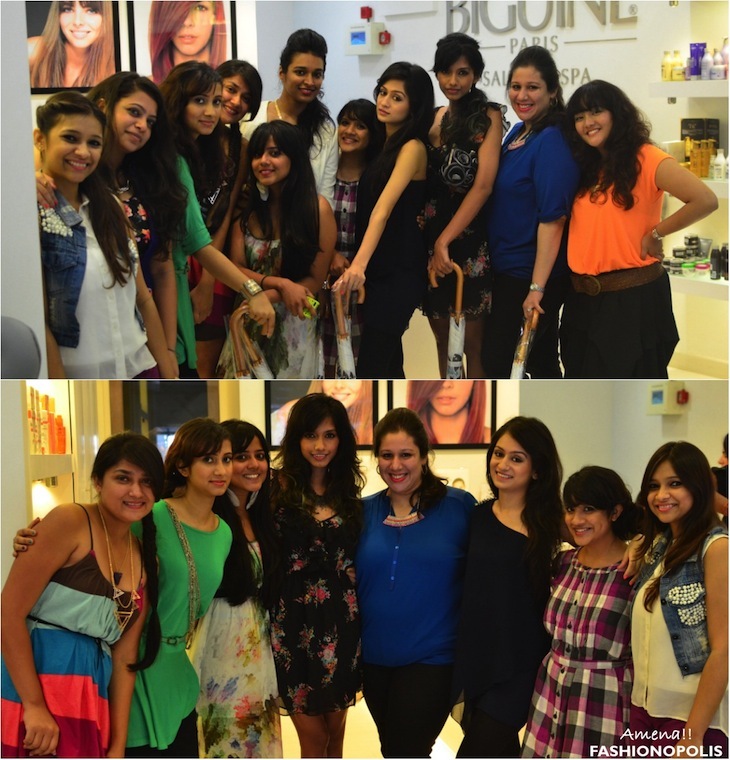 All in all, the entire event was a fun and learning experience for makeup lovers. Moving on to the next event of the week. Let me start by saying, the amount of different hairstyles- plus, how to self create them- that were taught to us could easily put some YouTube channels to shame. 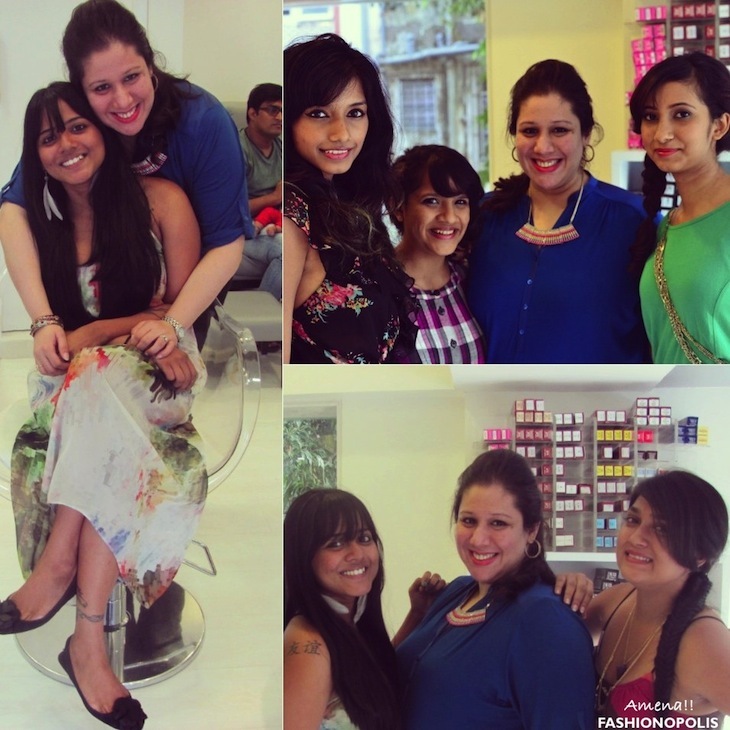 Rhea from FUSS invited me for a Monsoon Party that she was hosting in association with Jean-Claude Biguine Salon & Spa. I have always had a wonderful experience with the team of Jean-Claude Biguine. This one too was next to perfect. 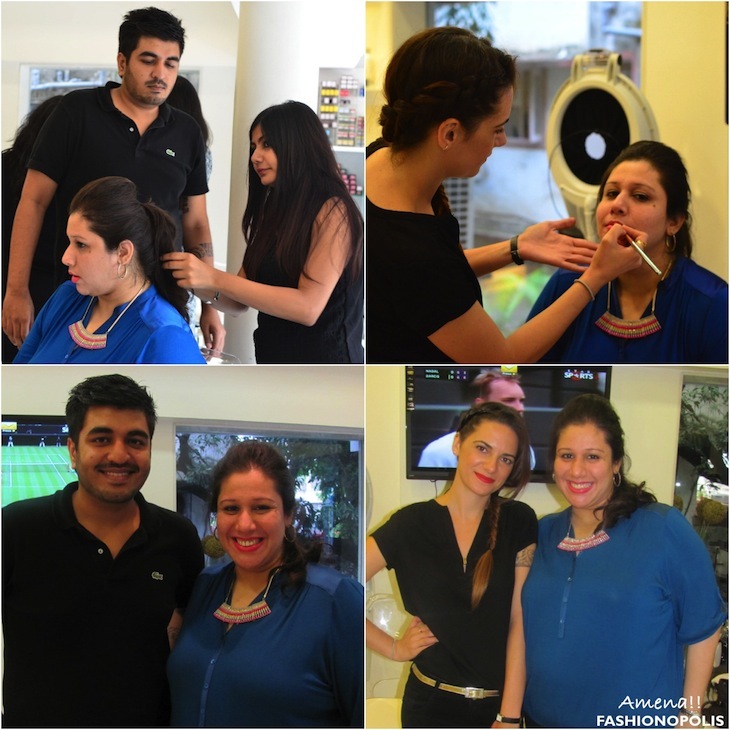 An afternoon filled with friends, fun and fab hairstyling session. I have two basic rules for a hairstyle: One, easy to create. Two, must suit my face cut. For the longest time I have believed that straight, blow-dried hair is the perfect hairstyle for me. That notion soon changed when Shayan, JCB's senior hairstylist decided to show me some easy to create hairstyles that would not only suit my face cut but also highlight my features. The JCB team tried two hairstyles on me, but the one in the pictures-front bouffant with ponytail- is my favourite one. 1. Using a wide tooth comb, comb through your hair. Avoid using brushes and fine tooth combs as they are not monsoon friendly and do more damage than help. 2. With the help of a tail comb separate the front portion of the hair out and secure the remaining in ponytail. 3. Gently back comb the left out front hair and with the help of bobby pins, pin them up near the middle of the scalp. 4. Use L'Oreal Paris Elnett Satin hairspray to set your hair. (This is a very mild hairspray and does not harm the hair). We all were in such high spirits after getting our hair done up, photos were mandatory! For more photos of this event visit Fashionopolis Facebook Page and Instagram. I have been flaunting my new makeup tips and hairstyle ever since I learnt them. What do you think of them? Share your views in the comment section. Beautiful!! Love ur statement necklaces! Hope you are having a wonderful day! Lovely ! 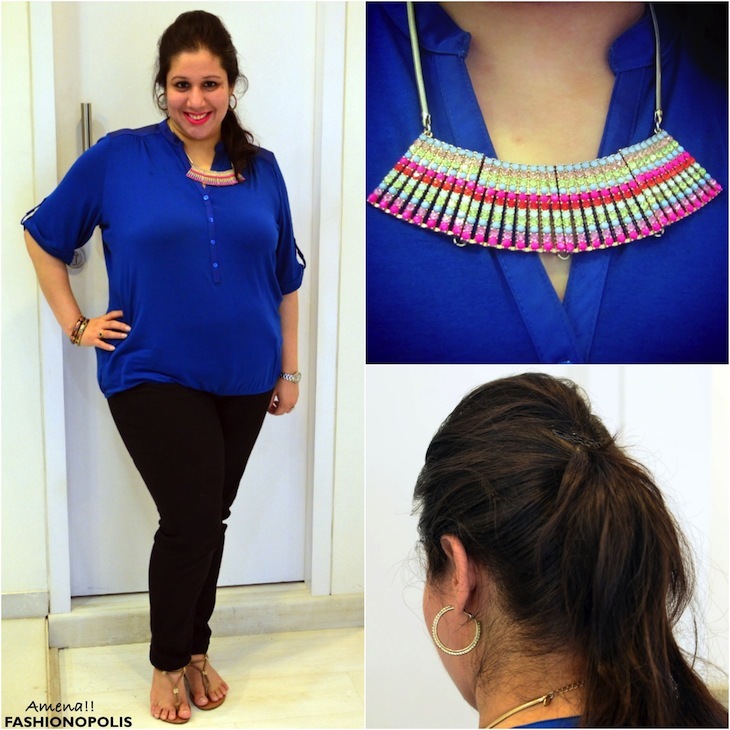 Loved your blue outfit and both neckpieces. I so wish I was a mumbaian. Here's to many more fun events! Lovely pics and all the collection I loved the nail paint colors too. I have really enjoyed reading your informative article and considering the points you made about fashion and silver jewelry ranges. Thank You for this excellent piece of writing about indian jewelry online. Looks like u girls had fun. I loved the nail job ur friend got. 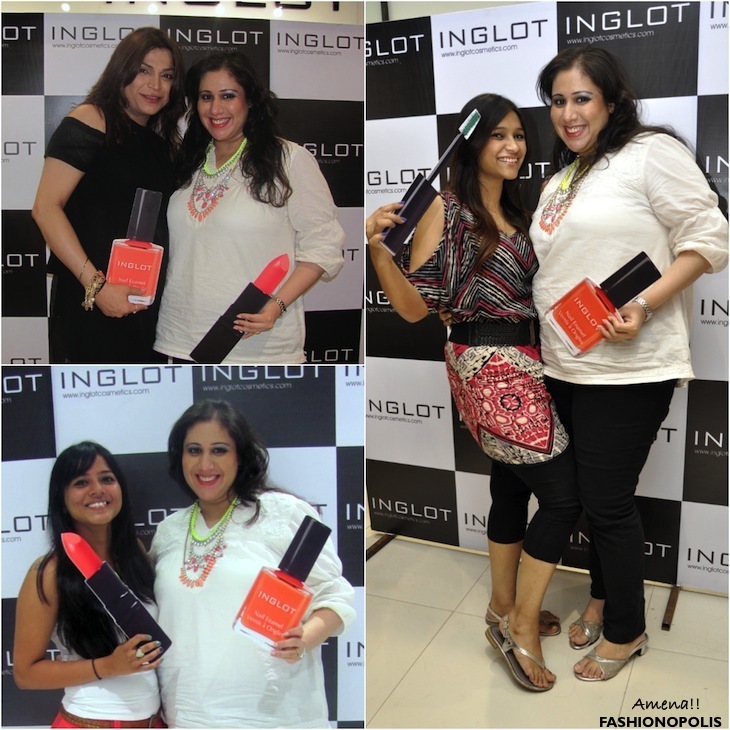 inglot is my fav brand! you guys are having fun and this is a good makeup!